Monarch Bay Villas are a beautiful small gated neighborhood with 52 condos in Monarch Beach, Dana Point, right atop The Monarch Bay Plaza, off Crown Valley Parkway. Monarch Bay Villas in Monarch Beach feature pool, spa, sauna, game room, gym, barbeque, and clubhouse amenities. They are located within walking distance to the many Monarch Beach area amenities and like many of Monarch Beach other luxury communities, it also offers ocean and golf course views. Search all Monarch Bay Villas homes currently listed for sale in the MLS, including short sales and foreclosures. For more information about any of these Monarch Bay Villas, call us at (949) 888-6788 or read more about the Monarch Bay Villas Real Estate options, or visit our Dana Point Real Estate section for other Dana Point Homes. The Monarch Bay real estate options are limited as all of them are condos. The streets within the neighborhood are Lumeria Lane, Atlantis Way and Pompeii Dr. The condos offer 2 to 3 bedrooms, with 2.5 baths. Designs are of two or three stories and one or two garages. The size of the homes goes from 1600 sq ft to 2050 sqft. 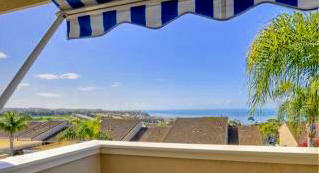 OCExecutives specializes in real estate transactions of Monarch Bay VillasHomes in Dana Point, California. Contact us today to sell real estate or buy real estate in the Monarch Bay Villas community of Dana Point or for more information about any of these Monarch Bay Villas homes. If you would like to see a list of homes in other communities in Monarch Beach or Dana Point, follow the links above, or click here for other Dana Point Real Estate.